The good: The formula can potentially increase your metabolism and burn fat. The bad: The company tries to trick you into thinking you’re buying the REAL fastin. They just bought the trademark name when real phentermine-based Fastin was discontinued. The bottom line: Fastin has potential to help you lose weight, but we don’t trust companies with such shady business practices. Fastin is a diet pill that hit the market as an appetite suppressing medication that contained phentermine. The creators of the drug, Smith Kline Beechman, chose to remove Fastin from the market in 1998. 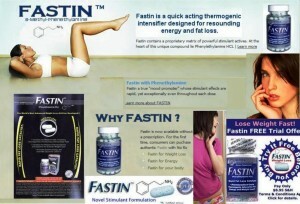 The distributor and manufacturer of Fastin chose to reformulate the drug and take advantage of now named brand. The new Fastin was released to the market under the same name but without containing phentermine this time around. Fastin manufacturers knew there was market for Fastin, but without the backing of a medical company, they could not release a prescription level medication. Instead, the Fastin needed to be transformed into a supplement. But, the company failed to let customers and consumers know of the change in formulation. On the contrary, they used the fact that the medication was once available only by prescription to boost their marketing campaign. At the heart of the misleading nature is Phenylethylamine HCL. 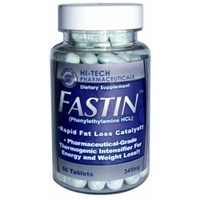 The original Fastin contained Phentermine HCL, not Phenylethylamine HCL. The delusion continues when the product claims to contain 37.5 mg of their active ingredient. There is clearly a need to piggy back off the popularity of the Phentermine Fastin which contained 37.5 mg of Phentermine. 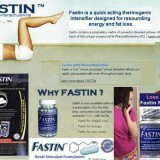 Hi-Tech Pharmaceuticals is the company that currently produces and sells Fastin. They are still registered for business in the state of George (check here), which is a good thing, but CEO / CFO / and Secretary Jared. R. Wheat, was also a previous agent for American Weight Loss Clinic, Inc which is not longer in business for undisclosed reasons. Dissolved? Cancelled? Terminated? While the company prides itself on Fastin being the end all of diet pills, the company remains the sole proprietor for Lipodrene, Lipodrene Xtreme, Anavar, Dianabol and Stamina-RX. To top off the problems, the website is broken down and poorly written. Can anyone say 12-year old “programmer”? When looking closely at the return policy, we see nothing special. The company will allow the return of unopened bottle of Fastin for the first 90 days. While this is normal, the money back guarantee is the best. For the forward thinking consumer, Fastin offers an auto-ship program. You will never again have to worry about running out of those diet pills AND for the small price of $139.90 every two months, you can lose weight too! What? The introductory bottle of Fastin is there to draw in the customer with the break even price of $8.95. After that, be prepared to pay high dollar for a diet pill that is based upon false premise. This is one of the most expensive diet pills on the market. To top it all off, the “fast” shipment will get to your door in 14 days. Thinking about canceling that autoship, you better work fast. Their marketing practices are full of holes and lies. The PEA complex is weak at best. 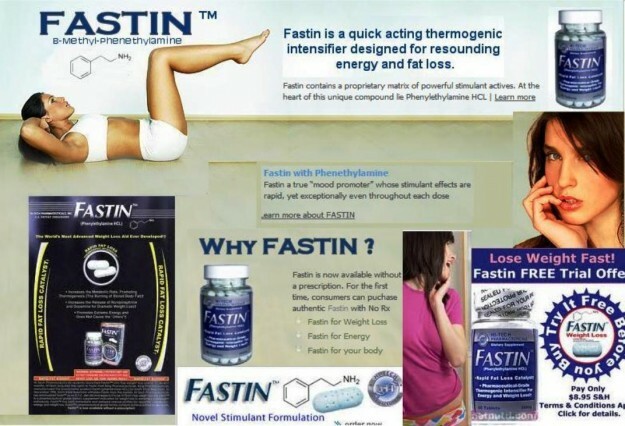 The manufacturer and distributor of Fastin is dishonest to say the least. The marketing campaign is based upon the deception of consumers who took the original Fastin. Entrusting your body and weight loss to a company that must lie to reach their sales goals may not be a great idea. The specialty lab that manufacturers Phentramin-d might not have fancy marketing like Fastin does, but it’s a safe, effective, quality product that boost energy and suppresses appetite like prescription Phentermine. I tried this and it made me jittery with a real fast crash…then I was so sleepy. Very disappointed. Maybe it works for others, not me. I felt ripped off when I read the label and realized I paid a lot of money and did not get Phentermine. The pills I received contain Phenylthylamine and give me heart palpitations and nausea. I dont like them at all !!!! I got ripped off!! I too thought I was getting the real thing. It raised my blood pressure and caused headaches. I would crash suddenly and feel like crap. I got ripped off. Pills taste terrible and are available much cheaper off ebay and the like, but they do suppress your appetite and give you a boost in your mood, which helps you lose weight. I liked them much better than other kinds I’ve tried, including NuPhedrine, real phentermine (which made me nasty)and Xtreme Trim. got ripped off,paid almost 90.00 dollars and got horse pills and everybody knows if you have taken fastin before they are small,really dissapointed and not to mention that the tablets turn a dark brown in color.what is up with that..very disappointed,how can they get away with doing people like that..very dishonest..never again…. I am disturbed at the lack of, if not the lack of misrepresentation of the formulated diet pill claiming to be authentic, when it is far from authentic. Shame on Hi-ech Pharmaceuticals for misleading thse who believe that are getting the real thing! i completely dissagree with the above information. First off fastin can be purchased at GNC for 39.99. Also, it is a wonderful appetite controller. I have to force myself to eat. The energy i get from these pills are amazing, i cant sit still which helps me fly through my Insanity program from beach body. I have already lost 3.2 lbs in three days. I feel great! My only issue is the stomach cramps i get shortly after taking the product, but this subsides within a half hour. First pills I buy that DO work!!! I recommend Fastin to anyone!!!! !..except if u have a heart condition, they do give me and my friend heart palpitations, then it just goes away. I have tried so hard to loose weight and nothing…up until I bought Fastin at Walgreens! you start eating and suddenly, you are FULL! They’re awesome!!!! Thanks Fastin!! !…about 15 pounds in 4 weeks! refer to other sites, including 21 other reviews from actual consumers on walgreens.com, or simply google on another site. I have tried several, lipozene being my favorite. I picked this one up because it happened to be next to the empty lipozene shelf. Did these pills make you feel sick to your stomach? I have been battling my weight for about a year now. Every diet that I start seems to work for like a week, and then I start gaining weight again. I decided that on top of exercising and watching what I was eating, I was going to start trying to use a diet pill. Went to walmart, and found Fastin on the shelf for $29. I bought them, and have used them for 2 days. I have lost 4.4lbs in 2 days of dieting. I didn’t even exercise at the gym yesterday and still noticed a dramatic difference int he way I feel and look. Unfortunately I did get a little jittery and hyper when I first took the pills, and then I had a massive crash in the afternoon (to the point where I had to lie down and take an hour nap because I thought I was gonna have serious issues if I didnt). Only gonna try it for a couple more days. If I don’t start getting a little bit better with the side effects, then I will discontinue use of the pills. I just bought FASTIN this morning at Walmart for 19.99, and so far its made be a bit jittery, but I’m not at all hungry, I feel like I can run a marathon, its not made me a bad person yet, hopefully this will stay true and let me loose the 30 lbs I’m needing to…. About two hours after taking this I felt light headed and tired. I layed on my couch and couldn’t get up I felt physically exhausted! When I would stand up I would get very dizzy. All I want to do is sleep! I’ve taken many things before and this is the first time this has ever happened. I took these pills and was losing a pound or some times three pounds a day just depends on how much activity and exercise I was doing! They do make u not want to much and that was making me feel sick so I ate in the mornings took the pill at like 12 p.m then ate soup at night! The did make me a little restless but I got alot accomplished in the day and was loosing weight fast! 1st off id like to say that I’m not being paid to say this but if they want to send me free bottles I’m all for it. Ok I’ve been taking fasting for 3 weeks, started off at 193lbs and I’m currently at 172″bs. 21lbs in 3 weeks, I don’t exercise I don’t do much extra, just the pills,work and cutting back my fast food intake. My craving for junkfood are almost nonexsistant and this is the easiest diet I’ve ever tried. This coming from someone who usually eats 5/6 cheeseburgers a week. The product works. $20 at walgreens. Sometimes Side affects nausea, drymouth, deheydration, light headed energyboost with crash, occur but its mostly during my most active hours. Overall with my results i recomend at least trying it. Not sure of my calorie intake but I’m sure I’ve cut it by at least 70% thanks to the suppresent. Well, I like them… They do taste nasty… But I’m willing to try anything once… I was taking another weightloss pill which was great, but they were out at Wal-Mart do I grabbed the Fastin… Guess I’ll know in a few days how well they work… And to those who don’t read the labels… It tells you that the pills are heat sensitive and should not be near moisture or they will turn brown in color… They specifically say do not remove the cotton or disiccant… But no pill works alone you’ve got to put forth some effort… People have to remember there is no such thing as a miracle diet pill!! I started taking Fastin a wk ago & I love it.. It makes my heart skip a beat every so often but it goes back to normal.. I have so much energy with it & dont feel as tired with it.. I try to eat but after bout 3 bites im full.. I stay thirsty but thats a good thing.. I paid $27 for my Fastin at Walmart.. I would highly recommend this product.. Its the only 1 have used thats actually seeming to work.. 1 wk on them & I have already lost 5 lbs.. I really like this stuff. However I think they market it wrong I take it before workouts and have seen some great gains. It also does a good job of being a appetite suppressor. However I become more hungry than normal when it wears off. i started taking fastin in november 2011 and i have lost 40 lbs. i have not changed my diet, i just eat less. i have tried many diet products. i finally like what i see in the mirror!!!! thank you fastin. Ive lost 13 pounds and im still dropping in size. I work at night so excersize is hard during the day. But these pills do work, not over night though give it a chance to get in your system and trust me ive tried alot of pills and im sticking to fastin. I love the energy it gives..
Oh I haven’t weighed myself yet but I can’t wait to see how much I lost its only been a week, but I will post again when I can to let yous know. FIRST OFF LET ME SAY THT IM ON MY 5TH BOTTLE OF FASTIN NOT SURE IF O SUPPOSED 2 BE TAKING EM THAT LONG IDK..BUT HOWEVER IM A( PRAYER) THEY WORKED FOR ME!! IVE HAVEN’T WORKED OUT & OVER 3MONTHS IN i LOST 30 POUNDS..ALL I DO. IS A lIL CLEANING ARND MY HOUSE AND I NEVER WNA EAT I. HAVE TO MAKE MYSELF EAT. AND WHN I DO IT’S A LITTLE….okay I dnt wna leave out nothing but on da other end my chest be feeling? real funny it feels lyk i be Havering a chest cold sumtimes. Oh by da way I agree with goonick. Sorry if I spelled ur name wrng but the pills could be found a Walgreens for 29$. I took 2 Fastin Saturday morning. I usually take 1 in the morning and 1 in the afternoon. I had been taking them for a week. About an hour later I was freaking out. I was in a full blown panic attack. I woke up my son and had him talk me through it for about 2-3 hours. He made me throw them away, which I did. If your on these I urge you to stop before the same thing happens to you. I still feel odd and it’s been 48 hours. Worked good was never hungry, but when I stooped taking fasting pills I was soooo hungry all the time, what’s that about? used fastin for one month and dropped 14 lbs. been droping about 6 lbs a month on weight watchers diet alone. really boosed my metabolism. thanks. When I found the over-the-counter strength Fastin, at Wal-Mart, I bought it. It was $27. I take half a pill (they are scored to break easily) daily and it really helps to decrease the appetite which is what I needed. I am doing P90X 6 days a week, but had to somehow control the appetite. If I take more, I feel awful…really nauseous and shaky. Half works very well for me and I have actually been losing weight for the first time in years. Don’t overdo it because the side effects are terrible and include nausea, rapid HR, shaky feeling and depression, to name a few. I realize that this Fastin product is not real phentermine. Still, I absolutely love it. I was on Phentermine and it worked, then stopped. Decided to lose more weight and tried this product instead of getting a prescription. I’d have to say the effects are very similar, just a bit lighter, but it really works. It suppresses my appetite, gives me energy and speeds up my metabolism. In the beginning, I kinda felt warm an tingly inside and phased out, it almost put me to sleep, but after a few days, I adjusted to it’s affects and feel great losing weight. It works, may not have real phentermine, but still works!! I’m on my forth bottle best thing ever. I lost 20 lbs. I have been taking them for about six weeks and I have lost 30 pounds. I absolutely love them and have told all of my friends about them.